The DigiPas DWL-280Pro digital torpedo level is designed to the stringent specification of IP67 Water Proof and embedded with advanced LED technology allowing for the brightest display. This levelling tool is built with high impact resistance ABS plastic and rubber material moulded with a solid V-groove aluminium base allowing high performance and reliability in the toughest working environment. The DigPas DWL280PRO has an accuracy of +\- 0.05°at 0° , 90° and 0.2°at all other angles. With 2 rubberized end caps, this digital level can well withstand impact. A buzzer feature makes audible beep sound at 0°. The hold function will freeze the angle display on the LCD. The unit also has a large magnetic base allowing for strong attachment to magnetic surfaces. IP67 Waterproof feature allows working in many harsh conditions such as offshore, hot deserts and freezing cold weathers. Water & dust proof features allow the tool to work in harsh conditions including off-shore, freezing cold weathers and wet tropical environments. Wide operating temperature range -20°C ~ +60° allow digital level to work on extreme hot desert to freezing cold weathers. Strong magnet at the level base enable users to hold a variety of metal surfaces which is useful in many practical applications. Measuring resolution of 0.05° with accuracy +/- 0.05° at 0° & 90° (+/- 0.2° at 1° ~ 89°). Instantly convert measurement unit from °(Degree) to %slope, mm/M & In/Ft at any angle. 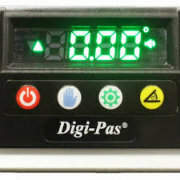 Digi-Pas DWL-280Pro helps to save a significant amount of time for building and setup of high performance racing car. It is used to measure suspension arm angles for computer analysis and to confirm the car frame is levelled prior to setup. Checking of wheel cambers, caster angles, rear wing angle, and straightness of side pods are able to be accomplished accurately and speedily. Angle of elevation for car rear spoiler is checked and adjusted timely using Digi-Pas DWL-280Pro which is portable and light weight. Ensuring optimum spoiler angle helps to decrease drag, increase efficiency in speed and decrease fuel consumption. The IP67 Water Proof feature of Digi-Pas DWL-280Pro is useful in drainage piping installation and repair works. Maintaining proper pipe elevation such as vertical position, horizontal slope and alignment between pipe ends maximize water drainage and prevent clogged drainage. Digi-Pas DWL-280Pro is used to setup drilling equipment in offshore Oil & Gas industry. Digi-Pas DWL-280Pro is used for alignment of drill tools. Digi-Pas DWL-280Pro is used for marine repair and shipbuilding vessels in shipyards. Digi-Pas DWL-280Pro maintains its performance over wide operating temperature ranges of -20°C to 60°C. The bright LED display technology and IP67 waterproof features ensure this indispensable tool to continuously working in extreme hot dessert, freezing winter or tropical wet climate for high-rise buildings construction. DIY satellite dish aligning has become speedy and effortlessly with Digi-Pas DWL-280Pro digital levels. It is used to ensure the mast/pole for the receiver is levelled and the dish is at targeted elevation to optimise satellite signal. Solar modules installation and periodical inspection fully utilized the Digi-Pas DWL-280Pro in getting accurate tilt angle. Wide measuring angle feature of Digi-Pas digital level enable solar modules to be perfectly tilted to the direction that maximise light exposure. Gutters and downpipes installation utilized the Digi-Pas DWL-280Pro for effective roof drainage system to divert and carry rain water. The in/ft and mm/M digital reading speed up adjustment of gutter inclination angle to a particular slope for different gutter length.